Nithu's Kitchen : Tell us about you Sameena. Sameena : I am a dentist, having my own private practice. I am from Nagercoil (Souther most part of Tamil Nadu). I have a cute 19 months old little angel. My hubby is a business man. Nithu's Kitchen : What are your interests Sameena. Sameena : Basically I love writing articles. Wish I had started blogging earlier! I love reading books, watching tv,listening to music,cooking,baking,singing,dancing,painting,gardening,spending time with my daughter and ofcourse my profession!i learnt Bharata Natyam for 5 years!Always take part in school day activities..Also an athlete..You cannot beat me if I run!! Just kidding..Have won many trophies!! Coming to cooking, I love trying out new dishes..I love baking..making sweets!! Love vegetarian and non vegetarian food..
Nithu's Kitchen : How many blogs you own? Tell us in detail about your blogs. Sameena : Yeah, I have 3 blogs in total. You all know My Culinary Creations well, apart from that, I have a dental blog where I discuss about dental problems that people face, another one is a family blog where I have articles on baby care and various other things. Nithu's Kitchen : How old is your food blog and how many posts do you have currently? Sameena : My cookery blog was started in July..I have about 101 posts!! Nithu's Kitchen : That is a good number of posts for just four months. Keep up your good work Sameena. As you are a Dentist, you would have come across many interesting patients. Do share about an interesting patient you met. Nithu's Kitchen : :-) Which part of blogging you would like to improve. Sameena : I love photography but I have a long way to go...would like to improve presentation as well..
Nithu's Kitchen : How do you balance your personal life, job and blogging? Sameena : Well,That's the tough part...No naps during day time!! Sameena : Well, I was thinking long and hard..Then I came up with Rava ladoo...I love sweets..I make them often.. In a fry pan,fry the rava or sooji with ghee on low flame...Fry also the cashews and almonds along with the coconut for some time..Now in a large bowl mix together the rava,cashews,almonds,sugar and coconut...Now add the luke warm milk slowly..Do not add milk hastily..Add only enough to bind together the rava along with the other ingredients..Make small balls and place them on the serving dish..Rava ladoos are ready..They are so easy to make! !I just love them..
Nithu's Kitchen : Thank You Sameena. We enjoyed talking to you. Friends, hope you all love Sameena's delicious Rava Ladoo. If you are interested to be featured as Nithu's Kitchen's Guest, please drop a mail to nithuskitchen[at]gmail[dot]com. hai,sameena happy to know about you in detail.lovely ladoo. Good to know more about Sameena! Thanx Nithu again! thanks for the introduction of multi faced sameena..
Good to know about Sameena... Lovely laddoos too.. It was really nice knowing more about Sameena..Yummy rava laddus..Loved the recipe!! Glad to know more about Sameena.. Very nice interview from Dr.Sameena!!! hey nitu, thanks for the interview with Dr. sameena! 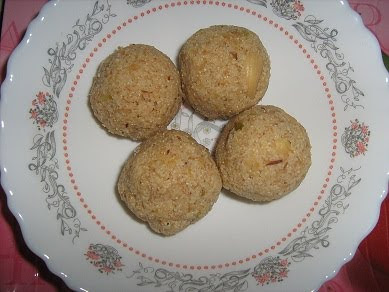 and nice recipe for the yummy laddoos! Yummy laddos and good to know more about Sameena..